A myringoplasty is an operation to repair a hole in the ear drum ("perforated ear drum"). How did I get a Hole in My Eardrum? Should the Hole be Repaired and When? Perforated ear drums typically result in a hearing loss. This may range from a very "mild" loss through to a "moderate to severe" loss. The hearing loss usually results in difficulty hearing in background noise. This is a significant issue in the school classroom, noisy workplaces and in social situations. The hearing loss may result in a reduction in ability to localise where sound comes from. Perforated ear drums are more susceptible to infection from the "outside world." That is, that contaminants from water or dust may pass through the hole in the ear drum into the middle ear and result in an ear infection with a resultant discharging ear. Ear drum repair is possible in young children, but it is important to be as certain as possible that the risk of recurrent "glue ear" or recurrent acute ear infections is as low as possible. 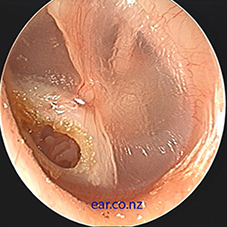 If a perforation has followed otitis media and grommet insertion, I recommend waiting for 3 years after the last grommet was inserted, depending on the health and function of the other ear. In adults these issues are less relevant, but risk factors for ear infections, such as nasal blockage or sinus disorders, should be treated first. We arrange an accurate assessment of the hearing (a diagnostic audiogram) prior to surgery, to measure the hearing loss caused by the hole in the ear drum and to enable measurement of the benefit afterwards. Hearing loss, dizziness, and facial muscle paralysis are rare, but can result from continued cholesteatoma growth. The operation is performed usually under a general anaesthetic (asleep), although in some adults this may be performed under local anaesthetic (awake). This is typically performed through the ear canal (a 'trans- canal myringoplasty'), or through an incision or cut made immediately in the skin crease behind the ear (a 'post auricular myringoplasty'). 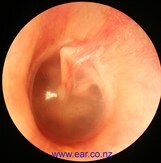 Sometimes the ear canal needs to be enlarged to enable good visual access to the front of the ear drum. If temporalis muscle fascia or perichondrium are used, the tissue is then inserted under the perforation and held in place with dissolving sponge. Dressings are then placed in the ear canal for a period of approximately three weeks. The sponge inside the ear dissolves over a period of a month to six weeks. There are dissolving stitches inserted either in front of the ear, or behind the ear. We arrange a check up three weeks after the operation. Are There Risks of the Operation? 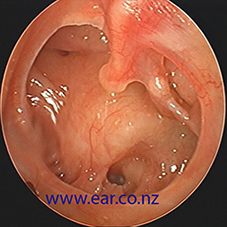 Cholesteatoma: an implantation of skin from the surface of the ear drum into the middle ear. May result in failure of the ear drum to heal, or a discharging ear (Rare in experienced hands). How do I Make Arrangements to have the Operation? 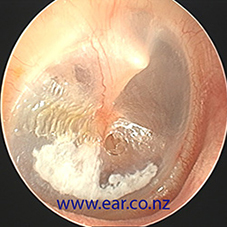 If you would like to make a booking to have the ear drum repaired, we will make arrangements for you. The procedure is performed at Gillies Hospital, Epsom, Auckland. In most cases it is possible to return home 4 hours afterwards (2 hours after a fat graft). There is only modest discomfort requiring paracetamol and an anti inflammatory medication. No food should be eaten from midnight the night before your operation, and no fluids taken for four hours before the procedure. It is common to have some bleeding from the ear for a few days following the operation. This can be easily controlled by changing cotton wool in the ear hole on a regular basis as necessary. Sport should be deferred for 3 weeks post op and the ear should remain dry usually for 5 weeks. If you have further questions, please do not hesitate to ask! We are here to make your operation safe, effective and as comfortable as possible.